Phonographic Copyright (p) – Wea Records Inc.
Textured gatefold sleeve with 8 page booklet attached to cover. Made in Germany [..] A Warner Communications company.℗ © 1976 WEA Records Ltd. SWAN SONG INC.
All songs published by Superhype Music Inc., ASCAP. Recorded live at Madison Square Garden, New York. All titles published by Warner Bros Music / Superhype Music. (A-side) ℗ 1976 WEA Records Inc.
B,C,D-side) ℗ 1976 WEA Records Ltd. I bought this album in a record store in England during the summer of 1985 or maybe 1986, but I've been unable to determine which is the release year. Any help? Is it someone here that know the release year of this reissue? I read with interest the discussion about the quality of the pressing etc. of side 3 with No Quarter and Stairway to Heaven. Listened twice yesterday to my copy and couldn't find any irregularities. It sounds still fantastic considering it is a live recording of a concert. I understand critics vary wildly in their opinion. 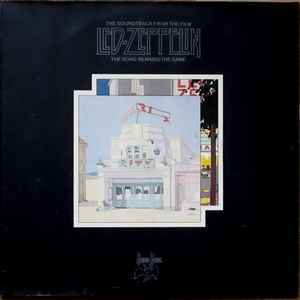 To me this double album is one of the best ever and together with Led Zeppelin II and Physical Graffiti ranks among the best they made. It is possible there are various dubious pressings in circulation and the turntable used + the amplifyer + the speakers might influence the overall impression. I would recommend using a separate woofer for the low frequencies or even quadrophonic speakers.